A new solar power plant in Datong, China is the cutest and the most adorable solar farm in the world. 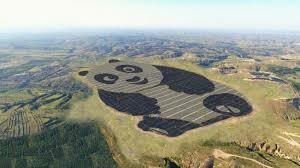 Most solar farms align their solar arrays in rows and columns; however, this solar farm is shaped like a giant panda. This project not only aims at providing green energy but it is also part of an effort to promote sustainable development among China’s young people. Built by the world’s leading eco-development solutions provider, Panda Green Energy Group Limited, this power plant is officially connected to the grid and is currently in the testing phase. This 248-acre solar farm will have a capacity of 100MW and is expected to produce 3.2 billion kilowatt-hours of clean energy in 25 years. That means it will eliminate about 1.056 million tons of coal, reducing carbon emissions by 2.74 million tons. As per the blue print, the farm is composed of the images of two black-and-white bears. The black parts of the pandas, like the ears and arms, are composed of monocrystalline silicone solar cells, while the gray and white part is composed of thin film solar cells. Panda Green Energy worked with the United Nations Development Program (UNDP) to make this project a success. They have plans to install more such panda solar plants.